The Mississippi Department of Archives and History has erected a series of markers throughout Mississippi commemorating important events, places and people in Mississippi history. Although we were looking for sites associated with the blues, we frequently came across these Mississippi Department of Archives and History markers and we found them very interesting. Here are some of the Mississippi Department of Archives and History markers we have encountered in our travels. We will be adding more as we develop this website. 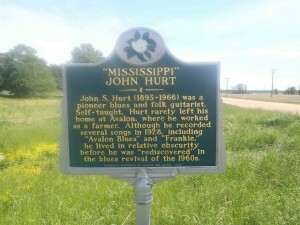 Mississippi Department of Archives and History marker for Mississippi John Hurt, Highway 7, Avalon, Mississippi. The J.W. 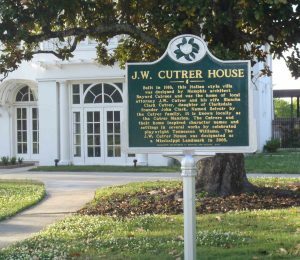 Cutrer House in Clarksdale, Mississippi and the Cutrer family that lived there are believed to have inspired several Tennessee Williams characters and locations. 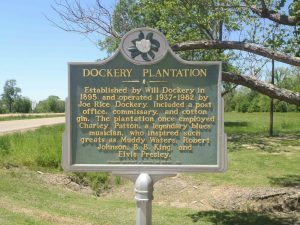 Dockery Plantation (now Dockery Farms) on Highway 8 in Sunflower County is considered “one of the primal sites” in blues history because musicians like Charley Patton and Howlin’ Wolf once worked there. There is also a Mississippi Blues Trail marker at Dockery Farms. Mississippi Department of Archives & History marker on the levee at Greenville, Mississippi. 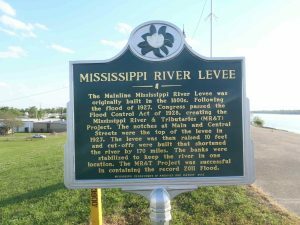 This Mississippi River Levee marker describes the effects of the 1927 Mississippi River floods and the levee system’s role in controlling flooding along the Mississippi River. The 1927 floods were the subject of Memphis Minnie‘s song, When The Levee Breaks, which was later covered by Led Zeppelin. Mississippi Department of Archives & History marker for River Stages At Greenville, on the levee at Greenville, Mississippi. 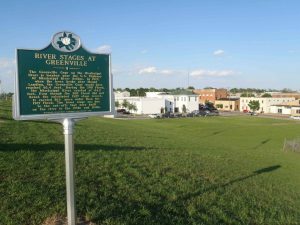 This marker for River Stages At Greenville describes the effects of the 1927 Mississippi River floods and the levee system’s role in controlling flooding along the Mississippi River. 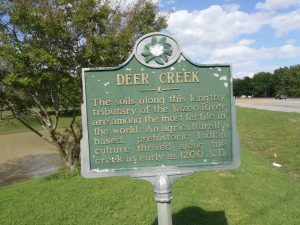 Deer Creek is a tributary of the Yazoo River which passes through some of the most fertile agricultural land in the world. Mississippi Department of Archives & History marker outside the Temple Theater, Meridian, Mississippi. 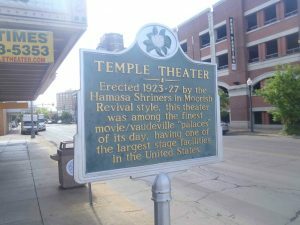 The Temple Theater was built in 1923-1927 by the Hamasa Shriners and was considered one the finest movie and vaudeville theaters of its day. 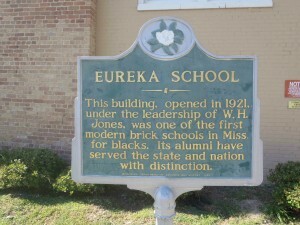 It has been placed on the U.S. National Register of Historic Places. 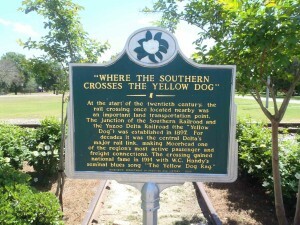 Where The Southern Crosses The Dog, Moorhead, Mississippi. 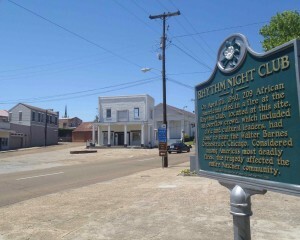 Rhythm Night Club Fire, Natchez…. 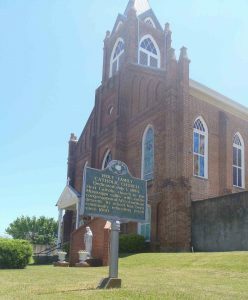 The Holy Family Catholic Church is located less than two blocks from the Rhythm Night Club Fire site in a neighborhood that has been placed on the National Register of Historic Places. This marker is outside the Mt. Zion United Methodist Church, a location which features in the 1964 murders of civil rights workers Michael Schwerner, James Chaney and Andrew Goodman. Mississippi Department of Archives & History marker outside the Old Neshoba County Jail, Philadelphia, Neshoba County, Mississippi. 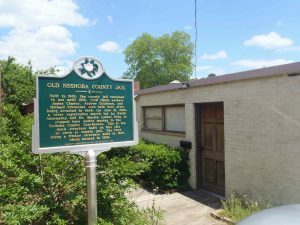 Old Neshoba County Jail, Philadelphia, Neshoba County. 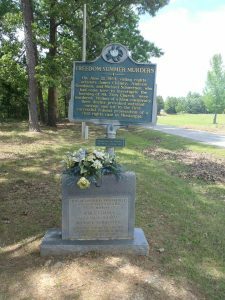 This Mississippi Department of Archives & History marker for William Faulkner is located 20 paces from William Faulkner’s grave in Oxford, Mississippi. 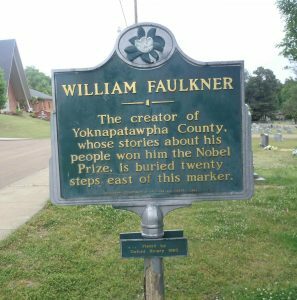 This Mississippi Department of Archives & History marker commemorating William Faulkner is located about 20 paces from William Faulkner’s grave in a cemetery near downtown Oxford, Mississippi. Mississippi Department of Archives & History marker at the entrance to Rowan Oak, William Faulkner’s home from 1930 until his death in 1962. 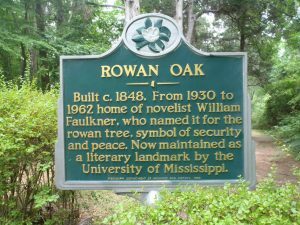 Rowan Oak was novelist William Faulkner’s home from 1930 until his death in 1962. It is open for public tours and is maintained as a literary landmark by the University of Mississippi. 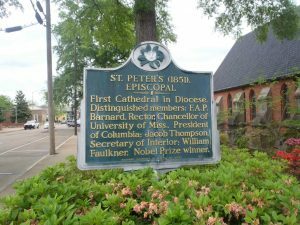 Mississippi Department of Archives & History marker for St. Peter’s Episcopal Church, Oxford, Mississippi. William Faulkner was a parishioner of this church. St. Peter’s Episcopal Church is in downtown Oxford, Mississippi. William Faulkner was a parishioner of St. Peter’s Episcopal Church. 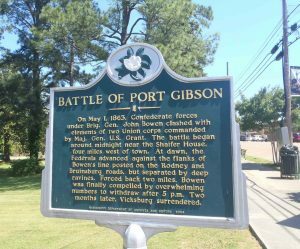 The U.S. Civil War Battle of Port Gibson was fought in May 1863. 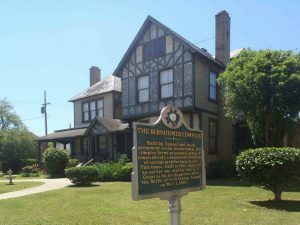 The Bernheimer Complex is a collection of late 18th and early 20th century buildings on Walnut Street in downtown Port Gibson, Claiborne County, Mississippi. 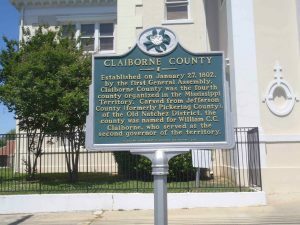 The Mississippi Department of Archives & History marker commemorating Claiborne County is outside the Claiborne County Courthouse on Market Street in downtown Port Gibson, Mississippi. 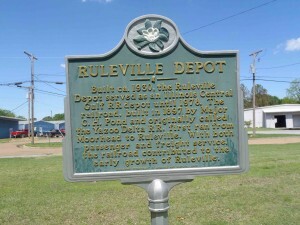 The Mississippi Department of Archives & History marker for the Ruleville Rail Depot building, now the Ruleville Chamber of Commerce, Ruleville, Sunflower County, Mississippi. The Ruleville Rail Depot in Ruleville was once the station for the Yazoo Delta Railroad, later the Illinois Central Railroad. It has been placed on the National Register of Historic Places. 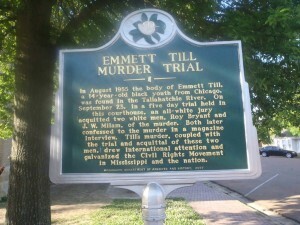 Emmett Till Murder Trial, Sumner, Mississippi. The Emmett Till murder and the subsequent trial in 1955 were events which sparked the Civil Rights movement. The Emmett Till Murder Trial was held at the Tallahatchie County Court House in Sumner, Mississippi…. Located at the Elvis Presley Birthplace Museum, Tupelo, Mississippi. 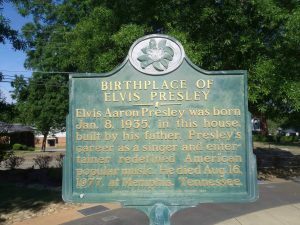 The Mississippi Blues Trail and the Mississippi Country Music Trail have also placed markers commemorating Elvis Presley at this site.